In this “dark and compelling…unputdownable” (Booklist, starred review) literary thriller, debut novelist Iain Reid explores the depths of the human psyche, questioning consciousness, free will, the value of relationships, fear, and the limitations of solitude. Reminiscent of Jose Saramago’s early work, Michel Faber’s cult classic Under the Skin, and Lionel Shriver’s We Need to Talk about Kevin, I’m Thinking of Ending Things is an edgy, haunting debut. Tense, gripping, and atmospheric, this novel “packs a big psychological punch with a twisty story line and an ending that will leave readers breathless” (Library Journal, starred review). Once this thought arrives, it stays. It sticks. It lingers. It dominates. There’s not much I can do about it. Trust me. It doesn’t go away. It’s there whether I like it or not. It’s there when I eat. When I go to bed. It’s there when I sleep. It’s there when I wake up. It’s always there. Always. I haven’t been thinking about it for long. The idea is new. But it feels old at the same time. When did it start? What if this thought wasn’t conceived by me but planted in my mind, predeveloped? Is an unspoken idea unoriginal? Maybe I’ve actually known all along. Maybe this is how it was always going to end. You can’t fake a thought. And this is what I’m thinking. It worries me. It really does. Maybe I should have known how it was going to end for us. Maybe the end was written right from the beginning. 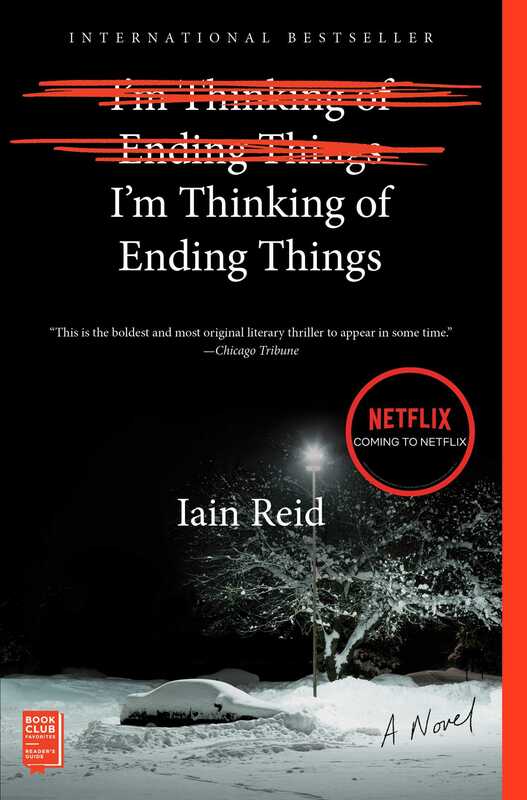 This reading group guide for I’m Thinking of Ending Things includes an introduction, discussion questions, ideas for enhancing your book club, and a Q&A with author Iain Reid. The suggested questions are intended to help your reading group find new and interesting angles and topics for your discussion. We hope that these ideas will enrich your conversation and increase your enjoyment of the book. As I’m Thinking of Ending Things begins, Jake and his girlfriend are driving to meet his parents on their secluded farm, but things aren’t what they seem. For one thing, as the girlfriend’s narration begins, she announces that she’s “thinking of ending things,” leaving the reader to wonder why she is making the visit in the first place. The visit itself is unsettling to say the least, and when Jake makes an unexpected detour, leaving her stranded, what comes next is a twisted mix of palpable tension, psychological frailty, and sheer terror. I’m Thinking of Ending Things is a stunning debut that examines the fragility of the psyche and the limitations of solitude. With tension building to an astonishing ending, it’s a book you won’t soon forget. 1. Discuss the significance of the title. Why does Reid choose to call his novel I’m Thinking of Ending Things? 2. Who is the “Caller”? Describe the calls he makes to the girlfriend. How do these calls help to further the plot? Why doesn’t the girlfriend tell Jake about the caller? Do you agree with her decision to keep the calls secret? Why or why not? 3. Why is the “Girlfriend” unnamed throughout the novel? What were your original impressions of her? When you finished reading I’m Thinking of Ending Things, did your feelings about her change? If so, in what ways and why? 4. There are conversations between strangers interspersed through the girlfriend’s narration. What’s the effect of including these conversations in the novel? How do they help you understand the story? Who do you think is speaking during these conversations? 5. Were you surprised by the ending of I’m Thinking of Ending Things? If so, were there any parts you found particularly shocking? What were they? 6. The girlfriend says, “I think a lot of what we learn about others isn’t what they tell us. It’s what we observe” (p. 29). Do you agree? What do you learn about Jake and the girlfriend by seeing their interactions with Jake’s parents? Are there other examples in I’m Thinking of Ending Things where the actions of a character tell you something about him or her? Discuss them with your book club. 7. When the girlfriend asks Jake if he thinks “secrets are inherently unfair, or bad or immoral in a relationship,” his answer is, “I don’t know. It would depend on the secret” (p. 30). What do you think? Are there circumstances where keeping a secret from your significant other is permissible? What are they? What secrets do Jake and the girlfriend keep from each other? 8. Jake describes himself as a “cruciverbalist” to the girlfriend when they first meet. Does his description give you any insight into his personality? If so, what does it tell you about Jake? What, if any, puzzles exist in the book that Jake attempts to solve? Is he successful? 9. Describe Jake’s parents’ farm. Was it what you expected? When Jake takes the girlfriend on a tour of the farm, she sees a chilling sight outside. How does this sight affect the girlfriend? Compare her reaction to seeing this sight to her reaction to Jake’s story about how his father had to put the pigs on the farm down. Why do you think Jake tells her about the pigs? 10. In describing the events at the school, an unnamed speaker says, “This isn’t about us” (p. 89). Do you agree with this statement? Why or why not? 11. While she is trapped in the school, the girlfriend says that “before tonight, when anyone asked me about the scariest thing that happened to me, I told them the same story. I told them about Ms. Veal. Most people I tell don’t find this story scary” (p. 172). Why does the girlfriend think the incident with Ms. Veal was scary? Did you find it frightening? If so, why? 12. The girlfriend tells Jake, “I’m glad we don’t know everything. . . . Questions are good. They’re better than answers” (p. 35). Why does the girlfriend feel this way? Do you agree with her? Explain your answer. Are there any questions that the girlfriend should have asked as she was getting to know Jake? What would you have asked? 13. Describe the basement in Jake’s parents’ house. Why does Jake tell the girlfriend that there is nothing in the basement? What does she find? When the girlfriend is in the basement, she remembers having a conversation with Jake where he told her, “We depend on symbols for meaning” (p. 107). What do you think makes her think of this particular conversation while she is in the basement? Are there any recurring symbols in I’m Thinking of Ending Things? Discuss them with your book club. 14. The girlfriend asks Jake, “How do we know when a relationship becomes real?” (p. 69). Discuss Jake’s answer. What do you think it takes for a relationship to be “real”? Do you consider the relationship between Jake and the girlfriend to be a real one? Why or why not? 1. During the first month of their relationship, Jake gives the girlfriend a copy of The Loser by Thomas Bernhard. Read The Loser and discuss it with your book club. Do you see any parallels between The Loser and I’m Thinking of Ending Things? What are they? 2. When the girlfriend meets Jake’s parents, she says “seeing someone with their parents is a tangible reminder that we’re all composites” (p. 96). How are you a composite of the people who raise you? Do you see any of your parents’ traits in you? Describe them to your book club. If you have children, are there any qualities that you hope to pass down to them? 3. Jake tells the girlfriend that, as a child, when he had trouble sleeping due to stomachaches caused by worry, “My mom would make what she called ‘kids tea,’ which was pretty much all milk and sugar, and we’d sit and talk” (p. 64). How might this have been helpful to Jake as a child? Did you have any rituals that you took comfort in growing up? What were they? 4. Iain Reid has written works of nonfiction, including a critically acclaimed memoir called One Bird’s Choice, which won the CBC Bookie Award for Best Nonfiction Book of the Year. Read his other works and discuss them with your book club. Did you see any similarities between Reid’s works of fiction and nonfiction? Which book did you prefer and why? Early on in the novel, the girlfriend asks, “How do we know when something is menacing? What cues us that something is not innocent? Instinct always trumps reason” (p. 17). Throughout I’m Thinking of Ending Things, you do a wonderful job of creating a sense of tension, causing the reader to abandon reason. How were you able to create such a palpable sense of menace? Were there any scenes that were particularly difficult to write? I think not knowing can often feel more unsettling than knowing. When something is fully determined and present, even if it’s menacing, it can become less distressing than something uncertain. Concealment and haze can simultaneously entice and threaten. You’ve written award winning nonfiction. Was the experience of writing a novel different? How so? Did you feel added pressure since your previous works were so well received? I never felt any pressure. I just wanted to try writing something very different from my first two books, and not just in form, but style and content. My two previous books were both about real events, mostly pleasant events, and real people in my life. I found, unexpectedly, writing this story felt even more personal than writing nonfiction. Writing fiction is also more difficult for me, which was part of the appeal. Your piece in The New Yorker about selling a book, http://www.newyorker.com/humor/daily-shouts/you-sold-your-book-please-sign-this-contract, is hilarious. What inspired you to write this piece? What was the experience of selling your debut novel really like? It’s thrilling, of course, when a publisher takes notice, and wants to publish your book, but after the release I found there was plenty of humour in the juxtaposition between that initial excitement of finding a publisher and the reality of publishing a book. The experience of selling my debut novel has been positive and interesting. I finished the first draft before submitting it to any publishers, and there was never any guarantee I’d be able to find one. The submission process can be nerve-wracking, particularly, it seemed to me, because I’m an unknown writer from rural Canada. It’s not like there was a line-up of publishers waiting to read it. There’s plenty of self-doubt, and a wide range of encouraging and discouraging feedback. You just hope it will eventually find its way into the right hands. For me, luckily, it did. Do you have any advice for aspiring writers? Is there anything you wish you knew before writing your debut novel? As I’m writing this I know it isn’t original and likely isn’t going to be overly helpful, but I would say try and read a lot and read widely. And if you’re lucky to have them, listen to your editors. I’m Thinking of Ending Things has drawn comparisons to Under the Skin, Gone Girl, and Jose Saramago’s early works. Were there different books, authors, or locales that inspired you while you were writing? Can you tell us about them? I admire those authors and books, and Lionel Shriver’s We Need To Talk About Kevin is another novel. The first time I finished it I started it again immediately. Like Michel Faber’s, I’d never read anything like Shriver’s book before. That’s a thrilling feeling as a reader. I don’t live in a big city, and I wrote a lot of this book at the farm where I grew up. The remote setting, the solitude, the quiet it had (and still has) an influence on what, and how, I write. Did you have any favorite moments in the book? What are they? No, I don’t think I have any specific favorite moments in the book. I enjoy the challenge of writing dialogue, so the car ride to the farm was an interesting section to write and revise. Did you know how the girlfriend’s story would end when you began writing? Can you tell us about your writing process? I didn’t know exactly how her story would end, but I had a strong sense. I like to start with an idea or concept or premise that interests me, and that I want to know more about, something I’ll be able to think about for a couple years. From there I avoid an outline. I prefer to have an understanding of the people in the story, but an imprecise plan of how it will all develop and evolve. And then I can start writing and find out. It’s good to be surprised along the way. I’m Thinking of Ending Things ends with reading instructions. If you could give your readers instructions about how to read your novel, what would they be? Why did you choose to end with a directive? I would feel bad (and overbearing) instructing a reader how they should read this novel, or any novel for that matter. It’s their book now, so that’s up to them. But I suppose, for me, I always get more from a book if I read it in a quiet place, in long, uninterrupted stretches. I would be happy to hear that a reader read this novel in one or two sittings. What would you like your readers to take away from I’m Thinking of Ending Things? What compelled you to write it? I think one of the most appealing payoffs of fiction is that each reader gets to react and interpret the story in their own way. While writing this story I thought a lot about people in my life, family and friends, and how it’s these relationships, more than anything, that provide meaning and richness to existence. That’s been a takeaway for me. I think one of the reasons I wrote this story is because I enjoy questions, and this book is about questions. Yes, I’m working on a new novel. Sadly, it’s still early days, and not much to tell yet. So instead of saying anything about it, maybe I can just use this space to thank those who’ve taken the time to read this book. I appreciate it. Thank you. "I'm Thinking of Ending Things is an ingeniously twisted nightmare road trip through the fragile psyches of two young lovers. My kind of fun!" – Charlie Kaufman, Academy Award winning writer and executive producer of "Eternal Sunshine of the Spotless Mind"
"In a novel this engaging, bizarre, and twisted, it shouldn't come as a surprise that its ending is even stranger than the narrative route that takes us there...but it does. Reid's novel is a road trip to the heart of creepyness." "I'm Thinking of Ending Things is one of the best debut novels I've ever read. Iain Reid has crafted a tight, ferocious little book, with a persistent tenor of suspense that tightens and mounts toward its visionary, harrowing final pages." "I’m Thinking of Ending Things begins with the unnamed narrator setting off with her boyfriend to visit his parents at their remote farm, and soon devolves into an unnerving exploration of identity, regret and longing. Delightfully frightening." "This slim first novel packs a big psychological punch with a twisty story line and an ending that will leave readers breathless." "One of the most anticipated literary thrillers of the season." "This is a deliciously frightening novel, Reid has a light, idiosyncratic touch but never lets his vice-like grip of suspense slacken for a second. Once finished, you will be hard pressed not to start the whole terrifying journey all over again." "...unrelentingly tense, expertly riding the line between paranoid and horrifying." "[An] energizing, bizarre and thoughtfully twisted tale will leave you stunned as you close the book."